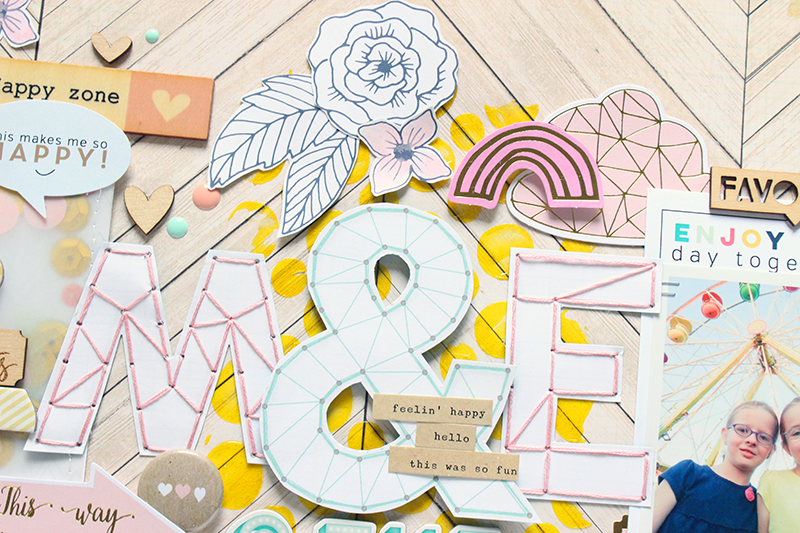 I am seriously in LOVE with the March 2015 Hip Kit & Add-On Kits from Hip Kit Club! This Kit is A-MAZ-ING!! The March Kit included the first PL Kit, and even though I’m not a Project Lifer, this Add-On is perfect for incorporating into your other projects. I mixed in items from the PL Kit, with the other Kits to create some fun layouts! 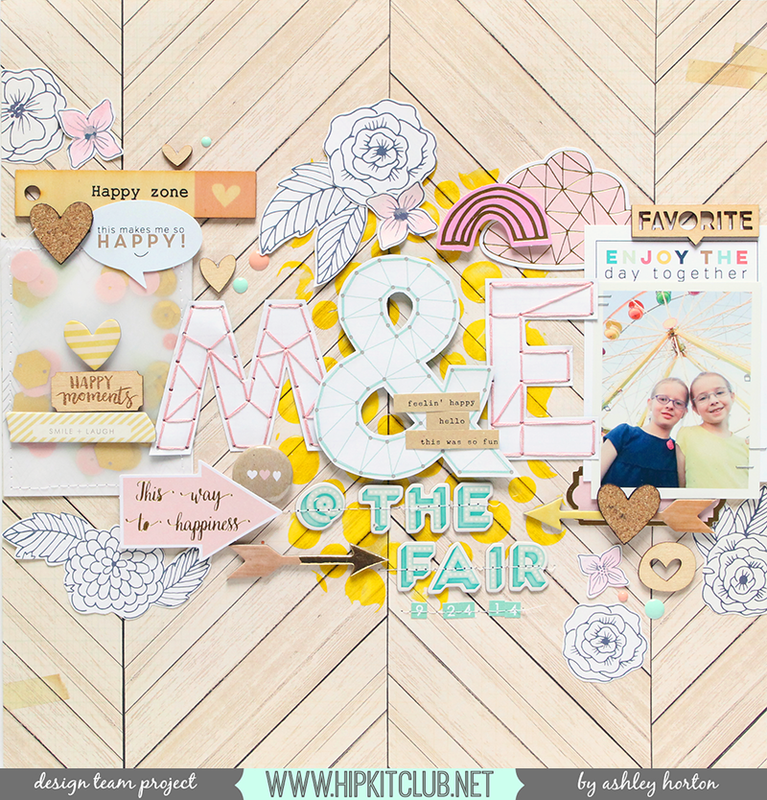 First up is my “M & E” layout, which also has a Process Video to go along with it. I had so much fun with this layout!! I used a lot of the Crate Paper, Pinkfresh Studio and Elle’s Goodies from the Kits. And I just knew I had to start out with that wood grain patterned paper! I also wanted to play with the fun Stencils included in the March Color Kit, so I mixed some of the Dylusions Yellow spray mist with a Heavy Gel Medium and used a spatula to spread the mixture over the Circles Small stencil. 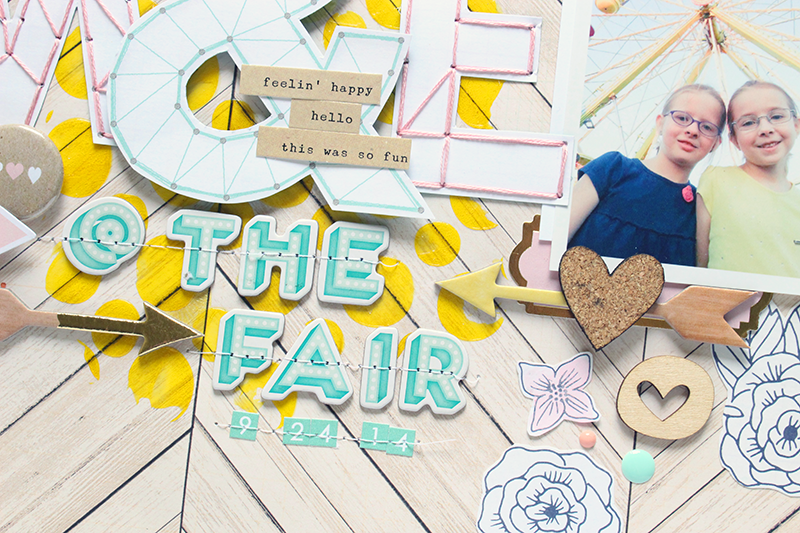 The Handmade paper is another fun pattern from Crate Paper, that is included in the March 2015 Main Kit. I cut out the cute string art letters and used them to create the title on my layout. To add a little bit more texture and interest to the fussy cut letters, I stitched with some coordinating embroidery floss. You can check out my newest Process Video, to see how I created the full layout! 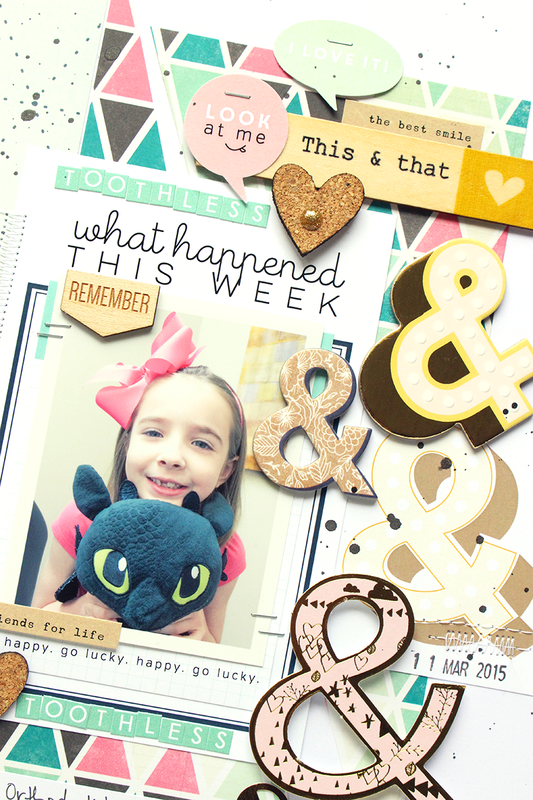 Next up is my “Toothless & Toothless” layout! I fidgeted with this one a lot at the beginning, because I knew I wanted to use the Crate Paper multi-colored triangle patterned paper, but just couldn’t figure out how I wanted it on my layout. Once I got the two large off-set triangle shapes cut and placed on the background paper, everything fell into place pretty easily. 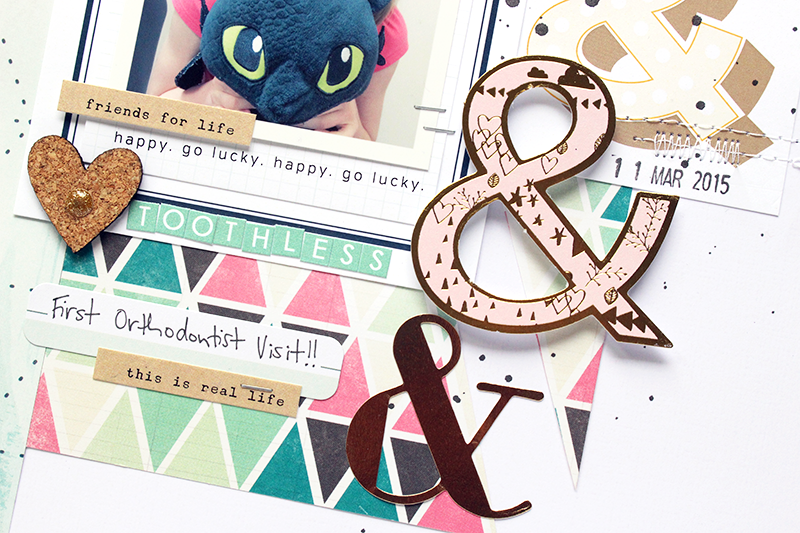 After I decided on the title, Toothless & Toothless, it gave me the idea to get all of the fun Ampersands included in the kits and use them as part of my title, but also as a design element on my page. I layered some of the PL cards behind my photo and used the cute Alison Kreft alpha stickers to create my title. I added some machine stitching, wood veneers and cork embellishments for another layer of texture on my layout. If you haven’t had a chance to purchase your March Kits yet, then don’t miss out! They are packed full of awesome products! Visit the Hip Kit Club website to check out each Kit and all that’s included.